Plate tectonics, which explains the structure of the earth’s crust and the movement of large plates covering the mantle, serves as the basis for key geological models dealing with climate, ocean circulation and other major phenomena. A geologist at the University of Houston’s College of Natural Sciences & Mathematics is reconstructing the Panthalassa-Pacific plates dating back to the Mesozoic era – which began about 250 million years ago – offering the potential to more precisely tune those models. 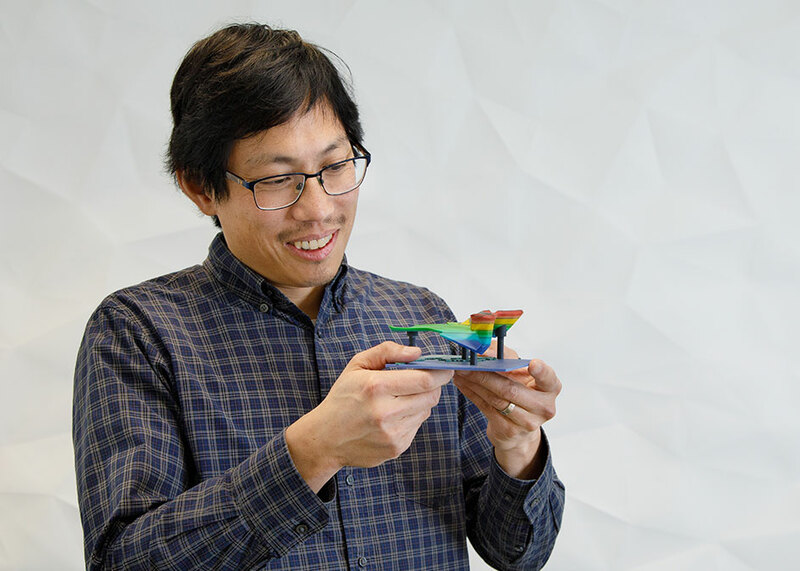 Jonny Wu, assistant professor of geology, has received a five-year, $568,309 National Science Foundation CAREER Award for the work, which will rely upon data gathered by tomography, a 3D image of the earth produced by measuring natural waves of earthquake energy moving across the mantle. Wu said that even with advances in modeling over the past few decades, there are still huge swaths of the planet where the plates are largely unexplained. He describes the mystery region as the area covered by ocean at a time when the seven continents were merged into the supercontinent Pangea. Preliminary research, by Wu and others, suggests that current models may not accurately describe the Panthalassa-Pacific, he said. The plates in that part of the world have been converging, with one plate slipping under the other in a process known as subduction. 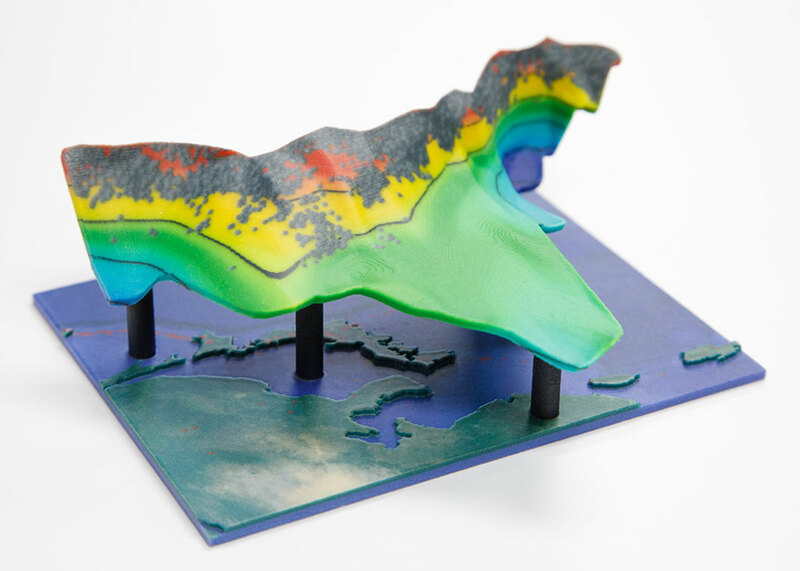 3D printed model of the subducted Pacific slabs within the mantle under China, Korea and Japan, based on 3D mapping from tomography. Earthquakes occurring near the slabs are shown by gray dots, while surface geography and volcanoes are shown by red dots. Sophisticated imaging techniques have reversed that thinking, allowing researchers to see traces of the plates. Wu’s project involves interpreting the imaging to reverse the subduction process in order to determine the earlier structure. Wu has proposed adding a unit on 3D spatial skills to the undergraduate curriculum as part of the education component of the CAREER award. Spatial skills are routinely used in the geosciences and are a core skill for STEM careers, and he said that studies show they can be taught. He also has begun a seminar series for students at Energy Institute High School, an energy-focused high school in the Houston Independent School District, to introduce geoscience and spatial skills. The traditional method of reconstructing the plates builds upon recognizing traces left behind when the plates subduct, or when one plate slides beneath an adjacent plate, including volcanoes and fragments of the original plate. Wu is taking a different route, using tomographic imaging to build the plate models and then predicting where the fragments should be, providing a way to verify the model’s accuracy. A better understanding of how the earth’s geology shifted tens of millions of years ago is relevant today, he said. “Preliminary research shows the Panthalassa could be very different from current models,” he said, so the work has the potential to improve geologic modeling for climate and other concerns.